Diagnosing and managing critically ill patients with renal dysfunction alone or as part of multiple organ dysfunction syndrome is a part of the daily routine in intensive care units (ICUs) . Mortality due to acute kidney injury (AKI) has been reported to be ranging from 23.8 to 78.5% in dogs [2–4]. Despite adequate medical management, renal replacement therapy (RRT) may be necessary to support the consequences of severe AKI . Considered standard in human hospitals, few veterinary facilities are equipped to provide RRT in Europe. As some such facilities are trying to establish an RRT program, various factors must be considered, such as availability, expertise, facility settings, resources, and costs . Intermittent haemodialysis (IHD) requires a sizeable investment to purchase and maintain specialized water treatment facilities, whereas continuous renal replacement therapy (CRRT) uses pre-packaged sterile fluids [6, 7]. Because newest CRRT machines allow to perform haemoperfusion and therapeutic plasma exchange on the same platform, they are now preferred in 80% of human ICUs . However, CRRT is technically demanding, often associated with the need for continuous anticoagulation, and requires 24-h supervision, which is costly . 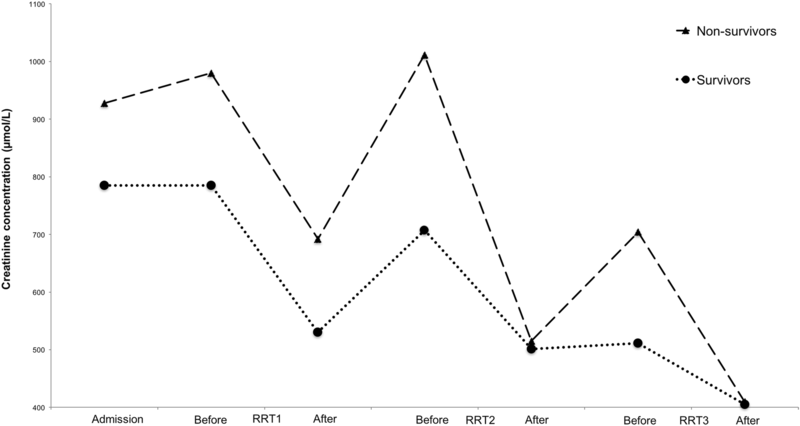 Although similar to other modalities regarding patient outcomes, intermittent RRT protocols are becoming increasingly popular in critically ill humans with AKI because it reduces care complexity compared to CRRT . Although costs and staff are important concerns in veterinary medicine, a 4-h intermittent low efficiency haemodiafiltration treatment may be a valuable option in veterinary ICU settings with limited staffing. To the authors’ knowledge, no such protocol has yet been published so far in the veterinary literature. While veterinary guidelines on the dose and the timing of initiation can be found elsewhere , only few studies have described the use of RRT for managing veterinary AKI patients, and all are focused on North American patient populations [10–15]. If and when a pet will recover kidney function are frequent questions in veterinary medicine, but causes of AKI, procedures specificity and survival rate may vary among centres. 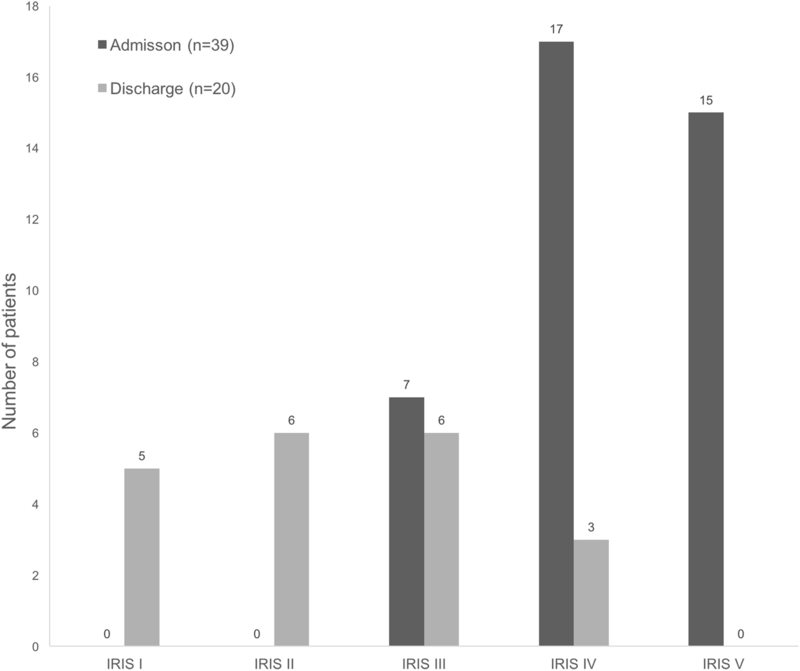 The present study describes a new specific 4-h intermittent low efficiency haemodiafiltration protocol to provide RRT in a veterinary ICU, and report characteristics, clinical features, aetiologies and outcomes in a European canine population with RRT-managed AKI. 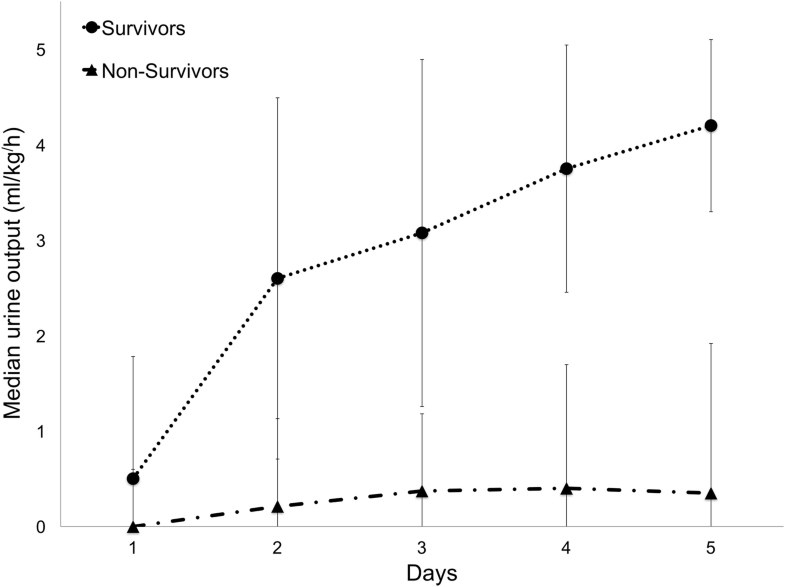 UOP was significantly lower in the NS group at admission and on each day of hospitalization. These results confirmed that oligoanuric AKI is associated with a poor prognosis [12, 42–44]. As suggested by Legrand et al. , decreased UOP appeared to be a marker of potential positive fluid balance and risk of fluid overload, which was a determinant in critically ill AKI human patient outcomes. Despite a statistical difference between groups in our study, admission UOP did not predict outcome in the multivariate analyses. However, UOP at day 3 was, in a predictive capacity (AUC = 0.9), comparable to that of published models with AUCs < 0.91  and < 0.8 . While admission parameter may be important initially, hospitalization parameter may be of valuable interest for the clinician, as a negative factor may indicate the need for a more aggressive treatment. On the contrary, if a prognostic indicator was suggestive of a potentially favourable outcome, it may convince disincentive owner to pursue medical care. In our study, several possible explanations may exist for the association of increased UOP at day 3 with higher survival likelihood. First, it has been previously shown in animals that tubular damage was more pronounced in oligoanuric kidneys . Second, it is likely that anuria occurs in the context of multi-organ failure and critical illness, which might be considered in many of our patients (e.g., leptospirosis and leishmaniasis) [43, 47]. Third, maintained UOP may directly benefit the outcome, as it is easier to control volume status and homeostasis . In conventional AKI management, creatinine serum concentration is used to classify severity and is also considered an excellent predictive tool [4, 48]. However, creatinine concentration at admission was not identified as a prognostic factor in our study, which is consistent with others’ findings [12, 39]. Moreover, in the context of RRT managed patient, creatinine will dramatically change because of RRT treatments. Thus, we tried to find a parameter that will represent endogenous change in creatinine concentration despite applications of RRT treatments. We hypothesized that inter-treatment increases in the serum creatinine concentration may have reflected the continuous progress of the disease or the absence of an endogenous creatinine clearance. In our study, creatinine kinetics, as represented by the DeltaCreat/h, was a prognostic factor. As established by the urea kinetic model, variation of timing in post-treatment sampling may cause imprecision, rebound is thought to be largely complete after 30 min, with reported creatinine variation lower than 15% over a 2-h interval [49–51]. Moreover, rebound has been suggested to depend on patient-related mechanisms such as intra-extracellular osmotic fluid shifts, changes in cardiac output or perfusion caused by blood volume changes, cardiac disease or vasoactive drugs . Thus, DeltaCreat/h, as defined in the present study, appeared to a prognostic factor. Strengths of this parameter are the ease of calculation and the high predictive capacity, which was similar to that of multiparametric published models [12, 39]. Without external validation, this parameter should be applied to other populations with caution, and further studies are required. Despite our expectations, no significant difference or correlation was demonstrated between referral or RRT initiation time and outcomes. As previously suggested, avoiding or delaying RRT was associated with increased mortality [47, 54–56]. To our knowledge, human studies have failed to establish a correlation between time to RRT initiation and patient outcome, possibly because a reference definition of ‘early’ and ‘late’ initiation is still lacking . Although we used a clinically relevant definition for the time between clinical signs to referral, this may not represent the real time between AKI occurrence and RRT initiation. Even if a potential benefit may exist for early RRT initiation, no clear guidance can be given from our study results, and further studies are needed .